The mission of the AWF is to develop future women leaders of sport from the UK and overseas, primarily through the Women’s Sport Leadership Academy (WSLA), to preserve the heritage of the women and sport movement through the Archive, and to conduct and facilitate research and scholarship on women and sport. 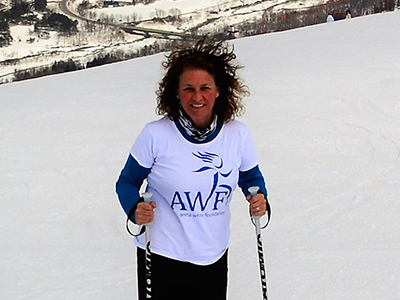 The AWF is comprised of a small, dedicated team embedded within the University of Chichester who contribute to the development of the women and sport movement – a collective of organisations and individuals who have worked to achieve their overriding objective of sustained activism to change sport for women. Anita White has had a long association with the University of Chichester, first as a member of staff from 1971-1990, and subsequently serving on the Board of Governors from 2001-2010. She has wide ranging experience of sport: as an international player and coach; of working in the public sector in higher education and sports administration; researching, writing and speaking on sport; and as an advocate for equality in sport in national and international circles. Anita qualified as a PE teacher in the late 60s and taught in schools and teacher education institutions for 12years. She then went on to gain Masters and Doctoral degrees before helping set up the first Sports Studies degree course at West Sussex Institute of Higher Education (now the University of Chichester) in 1982. In 1990, she joined the Sports Council as Head of Development and went on to become one of three Senior Directors of Sport England in 1995. During her time at Sport England she was responsible for the development and delivery of national policies and programmes for the development of sport at all levels. A former international sportswoman, Anita captained the England Hockey team to victory in the World Cup in 1975 and has also coached at all levels. From 2002-2004 she was the President of the Great Britain Olympic Hockey Board. Anita is also an acknowledged leader in the women and sport movement. A founder member and former Chair of the Women’s Sports Foundation (UK) she was responsible in her Sports Council role for the staging of the first international conference on Women and Sport in 1994. This resulted in the Brighton Declaration on Women and Sport that now has world-wide currency. She co-chaired the International Working Group on Women and Sport from 1994 to 1998 and has advised many countries, organisations and individuals on women’s sports development. She was awarded an OBE in 2005 for services to women and sport. Since 2000, Anita has worked as an independent consultant in the field of national and international sport policy and sports development. Consultancy work has included evaluation of the gender equality policy for the IOC, evaluation of the Dreams and Teams programme for the British Council, evaluation of pilot international development programmes for UK Sport, and the compilation of a worldwide progress report on Women and Sport for Sport Canada. She was a visiting Professor at Loughborough University from 2001-2008, and senior international advisor to Japanese Women and Sport from 2000-2006, assisting in the establishment of the Asian network for women and sport. Voluntary work has included serving on the Boards of the University of Chichester, the Golf Foundation, International Development through Sport (UK), International Council for Sports Science and Physical Education, International Inspiration, and the International Working Group on Women and Sport. Elizabeth is the Co-Founder of the Anita White Foundation and previously worked at the University of Chichester before taking on her current role as Head of Sport, Health and Exercise at the University of Hertfordshire. She has also been a speaker at many Universities and conferences both in the UK and abroad. Elizabeth serves on the editorial board of the journals Leisure Studies and the International Review for the Sociology of Sport. She is the past-President, and member of the executive board, of the International Sociology of Sport Association. Jordan joined the University of Chichester in September 2010 on a doctoral studentship, became a Research Officer for Women and Sport in September 2013, and a Senior Lecturer in September 2015. Throughout this period, he has acted as clerk and then coordinator of the AWF since its inception. Jordan also coordinated WSLA 2014 & 2015, and, in June 2014, both Jordan and Elizabeth were part of a keynote presentation for a global women and sport research project at the 6th World Conference on Women and Sport in Helsinki, Finland. In September 2015, the AWF was delighted to welcome two young female scholars who had successfully applied for PhD studentships advertised by the University. As part of their bursary, they contribute to the development of the AWF. Lucy Piggott is undertaking a doctoral studentship titled 'Gender, Leadership and Organisational Change in English Sport Governance', with a focus on the underrepresentation of women leaders and decision-makers in two national governing bodies of sport. Her PhD encompasses a transformative element by informing organisations and policy-makers on how to better work towards greater gender diversity and gender equity in sports leadership. Lucy’s work has informed two book chapters that she has co-authored on women's sport leadership to be published in 2017. Lucy and Lombe are part of the AWF operational management group and are members of the local organising group for WSLA 2017. Since May 2010 the University of Chichester has made significant financial commitments to the AWF through the management time of Professor Elizabeth Pike (Head of Sport Development and Management), the provision of a dedicated room to house the collection, and through the appointments of a professional archivist and a 3 year bursaried postgraduate studentship. Moreover, senior University figures have provided their time and guidance to ensure the development and success of the AWF.